Ahead of the IMF/World Bank Group meetings, KfW Group on behalf of the German Federal Government, the European Investment Bank (EIB) and the Agence Française de Developpement (AFD) launched the Clean Oceans Initiative to support the development and implementation of sustainable projects that will reduce pollution in the world’s oceans over the next five years. This partnership will provide EUR 2-billion long-term financing for projects aiming at reducing marine litter, especially plastics, as well as untreated wastewater discharge, with a view to crowding-in private sector investment. The three partner institutions will combine their expertise and experience to support the development and implementation of viable projects in this sector. The Clean Oceans Initiative will also provide innovative financing structures catering for the needs of private enterprises of varying size, including micro-enterprises, and for research and innovation projects. 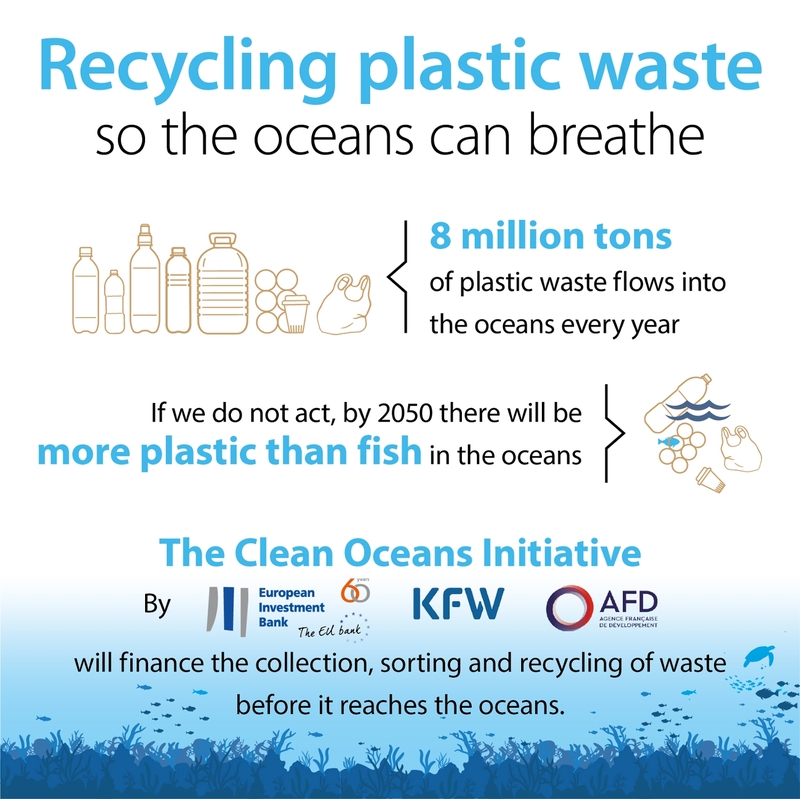 The Clean Oceans Initiative is global in nature but will focus particularly on operations in riverine and coastal areas in developing countries in Asia, Africa and the Middle East, since ninety percent of plastic waste enters the oceans through 10 major river systems located in Africa and Asia, where access to regular waste collection and controlled waste disposal often lacks. Support to the implementation of wastewater treatment plants that enable reduction in the discharge of plastics and other pollutants to rivers and oceans. Oceans are a global public good, providing natural resources including food, medicines, and biofuels. Over three billion people depend on marine and coastal biodiversity for their livelihoods and the market value of marine and coastal resources and industries is estimated at EUR 2 600 billion per year, so about 5 per cent of global GDP. Maintaining clean oceans is therefore crucial for sustainable development and poverty reduction by increasing people’s income and improving health. It also supports climate change mitigation as oceans absorb about thirty percent of carbon dioxide, buffering the impacts of global warming. An estimated 8 million tons of plastic waste and microplastics, is discharged into the world’s oceans every year, threatening marine ecosystems, people and communities that depend on clean oceans. If we continue along this path, it is estimated that by 2050 there will be more plastics than fish in the oceans by weight.